Katie Lightfoot's tired of loafing around as the assistant manager of an Ohio bakery. So when her aunt Lucy and uncle Ben open a bakery in Savannah's quaint downtown district and ask Katie to join them, she enthusiastically agrees. 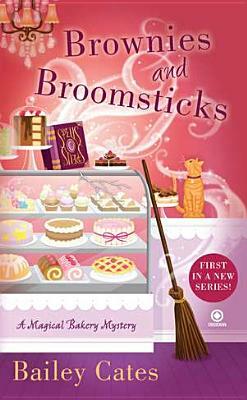 While working at the Honeybee Bakery—named after Lucy's cat—Katie notices that her aunt is adding mysterious herbs to her recipes. Turns out these herbal enhancements aren't just tasty—Aunt Lucy is a witch and her recipes are actually spells! When a curmudgeonly customer is murdered outside the Honeybee Bakery, Uncle Ben becomes the prime suspect. With the help of handsome journalist Steve Dawes, charming firefighter Declan McCarthy, and a few spells, Katie and Aunt Lucy stir up some toil and trouble to clear Ben's name and find the real killer..
Bailey Cates believes magic is all around us if we only look for it. She is the New York Times bestselling author of the Magical Bakery mysteries. She is also the author of the Enchanted Garden mysteries, writing as Bailey Cattrell.